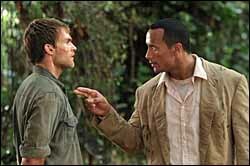 The Rock tires of Seann William Scott's Stifler stories. A bookie enforcer working toward his dream of owning a restaurant, Beck (Dwayne "The Rock" Johnson) is as tough as they come. His latest assignment is to head down to a small South American gold mining town called El Dorado to retrieve a kid named Travis (Seann William Scott), who is on the brink of discovering a priceless ancient statue. Also inquiring about the treasure is Hatcher (Christopher Walken), the town slave driver, and Mariana (Rosario Dawson, "25th Hour"), a local rebel leader who can see the monetary value of the artifact helping her enslaved people. Travis doesnÕt want to leave, and as Beck tries to forcibly remove him, the duo get further and further into trouble in the vastness of the deep jungle. "The Rundown" (IMDb listing) attempts to pick up the baton dropped by such action film luminaries as Arnold Schwarzenegger, Steven Seagal and Jean-Claude Van Damme. Assuming the audience is hungry for these types of thrills again, "Rundown" is packed tight with fisticuffs, shootouts, wire-assisted tackles and exploding trucks. It's meant to introduce Johnson to the world of action, after his uneventful starring debut in the rancid "The Scorpion King." I just don't recall anyone asking for a revival of this genre. With straight-to-video titles arriving weekly, there hasn't been a lull in action spectacles in decades, and "Rundown" hardly has the imagination to reinvent the wheel. Peter Berg, the former actor who was last seen directing the cinematic bowel movement "Very Bad Things", helms "The Rundown." Berg has a professional wrestler as his star, and he directs his film to match the intensity and fraudulent spectacle of the wrestling circuit. Berg pummels the screen with numbing, rapidly edited visuals, which get increasingly ridiculous as the film unspools. He also never meets a sound effect he doesn't like, testing the dexterity of an average theater sound system with thudding noises for even the slightest twitch in the action. "Rundown" is meant to be a cartoon, albeit a violent, often laugh-free one--if you ever wanted to see a monkey hump The Rock, here's your chance. But Berg doesn't know when to pull back. The film becomes a messy dinner plate of visuals and information after a short time, destroying the fantastic jungle vistas and attempts at silly comedy, which is always welcomed. Berg just isn't that interesting a director, and his testosterone-amped filmmaking skills smother the material. I would even go so far as to revoke Berg's DGA card, as his opening action sequence is set inside a dance club, with the overuse of a strobe light to help mask his special effects. A strobe. You might as well place a sign on the bottom of the frame that reads, "Please do not look at the screen." What Johnson has over his action forefathers is charisma, and an ability to enunciate clearly. Armed with a charming, commanding screen presence, Johnson takes full advantage of the film's potential to launch him into movie stardom. I like Johnson, even when he's working below his talents. He often single-handedly keeps the "Rundown" interesting, and his efforts are only crippled by Berg's incessant editing and the script's lame bravado. While Seann William Scott plays his umpteenth variation on his "American Pie" Stifler character, and Rosario Dawson tries on a weak South American accent, Johnson keeps the film appealing with his confidence and natural ability. Not even Peter Berg can erase that. But heavens he tries. Christopher Walken shows up as the villain of the piece, and his performance is much like his recent check-cashing turns in "The Country Bears" and "Gigli." Walken hams it up mercilessly, trying to have fun in a film that is diametrically opposed to it. After "Catch Me If You Can" challenged Walken to act again (with near brilliance, mind you), his classic kooky routine just isn't as fun to watch anymore. I would hate to place Johnson in the ranks of the Van Dammes of the industry, but if he continues to make disposable action dreck like "The Rundown," he'll do all the work toward obsolescence himself.